Despite consistent personal skepticism of the "Harry Potter" franchise over the past two years, "Harry Potter and the Prisoner of Azkaban," the third installment into the series, opened on the screen with nothing less than pure enthusiasm on part of yours truly. At a time when the movie theater has seemingly been bombarded with endless mediocrity, it is pointless to be finicky; and besides, the concept of revisiting Hogwarts and all its magical corridors promised a lot more upfront than most recent blockbusters have been willing to provide for an entire two hours. It didn't hurt matters, furthermore, that Chris Columbus, the director of the deeply-flawed first two films in the series, was only acting as a producer this time around; directing credits instead went to the very talented Alfonso Cuaron, whose highly-regarded Mexican drama "Y Tu Mama Tambien" from a couple years back has given him more than enough good reputation to ensure the "Harry Potter" legacy some kind of fresh perspective here. Once the viewer considers this notion, then "The Prisoner of Azkaban" begins to seem like a step in the right direction. The differences between this and Columbus' films are notable, too: the style is more gothic, the narrative more direct, and the characters less curious and more fueled by fear. Those who would like to tell us that the "Harry Potter" novels get progressively dark did those of us outside the hype a service; without such a warning, who would believe that the colorful and vibrant world of young wizards was much more dangerous than what the earlier endeavors suggested? As you absorb the movie in all its murky exteriors, it becomes apparent that whatever the intentions are of any director involved with this franchise, they can't avoid the one simple truth: that as time goes by, Hogwarts is seeming less like Willy Wonka's Chocolate Factory and more like Camp Crystal Lake. Although this is by no means a flaw to the progression of the "Harry Potter" stories, it becomes a separate issue entirely when the style dictates the substance and subsequently detracts from narrative detail. Unfortunately for both Cuaron and his audience, "The Prisoner of Azkaban" falls into this trap rather early on, dazzling the eyes so incessantly with an ambitious foreground that the interiors never have much of a chance to emerge. What exists following a promising premise is basically just a series of dry and stagnant story twists in which young wizards react, rebel, exchange witty dialogue and occasionally get caught by a superior doing something he or she shouldn't be doing in the first place. This film is the least-satisfying in the ongoing series thus far, and the fact that the established flaws can't even be corrected by a completely new director only adds fuel to the fire for those who have become cynics to this whole plot. The movie takes place during the title hero's third year attending Hogwarts Academy, that ever-so-fascinating school for young wizards and witches that teaches them how to utilize and manage their magic in ways that would allow them to live normal lives in standard human society. That isn't much of a comfort to Harry's (Daniel Radcliffe) guardians, though, who for the past two years have tried to prevent him from vacating his position as the family slave and going off to learn about the art of magic. At the opening of "The Prisoner of Azkaban," however, we are no longer seeing the same innocent kid who tiptoes around his keepers seeking approval; instead, we get a confident young lad on the verge of puberty, who does as he is told but is no longer afraid to have a voice that contradicts those above him. This approach also results in one of the movie's biggest early jokes, in which a distant relative aunt pays a visit to the family, speaks negatively of Potter's deceased parents, and then balloons up right before everyone's eyes before floating off into the night sky. I guess if you're a teenage wizard with an angry streak, you do things like that. Unfortunately for Harry, those kinds of foolish decisions are not exactly something that will benefit him at Hogwarts in the new academic year. Reason: the man who contributed to the slaying of his parents, a seemingly vengeful lunatic named Sirius Black (Gary Oldman), has escaped from Azkaban prison and appears to be en route to the school itself, presumably to finish the job of completely obliterating the Potter family name (you will recall that Harry, as an infant, barely survived an attack that caused the demise of his parents). As such, the school goes on high alert just as it opens its doors for a new year of classes, and the movie anchors the gravity of this situation by practically turning Hogwarts into a secluded prison, with silent dark shadows called "Dementors" stationed at every entrance and exit to ensure Sirius Black does not penetrate the school walls. On the inside, the looming threat of a villain making an appearance does little to undermine the adventurous (and rigorous) lessons offered by the academy's colorful array of professors. Familiar faces like the foreboding Argus Filch (David Bradley) continue to populate the adult sector of the movie, but its most notable contributors are the newest additions to the staff: Professor Lupin (David Thewlis),an expert on weaving spells that combat childhood fears, and Sybil Trelawney (Emma Thompson), a wacky tea leave reader who, if not for the fact that her screen time is limited, might have provided the film with an overabundance of comic relief. he conflicts, of course, are not as much problems for Harry Potter exclusively as they are for him as well as his two closest companions, Hermione Granger (Emma Watson) and Ron Weasley (Rupert Grint). 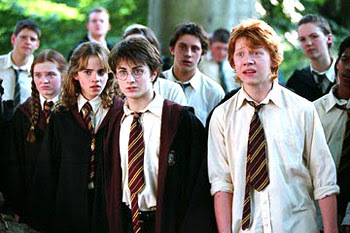 As this series evolves, it becomes increasingly apparent that the main focus of heroism lies not with one specific individual but more with the effort of a group collaboration, and in "The Prisoner of Azkaban," our three main characters seem more engaged by their synergy than before; the problems are faced collectively rather than on individual terms. Consider a scene in which the three teens are trying to save the life of a winged creature before it falls victim to an executioner's blade, or a scene in which the three finally come face-to-face with their adversary and the true intentions of suspicious characters are finally revealed. These are not personal triumphs for Harry Potter anymore; he is only the spearhead of a troupe of bright and energetic wand-wielders who each have much to gain (or lose) in how dilemmas will play out. But compared to what Cuaron offers us in this generally tame endeavor, both "The Sorcerer's Stone" and "The Chamber of Secrets" actually seem like effective adventures with thorough payoffs. Despite his overzealous desire to see and do everything possible in two-and-a-half hours of celluloid, director Chris Columbus at least understood the plight of his heroes in the first two movies and worked the narrative around them. His successor doesn't quite have that stigma managed; the plot seems to move completely on its own accord, dragging along its three protagonists like mere little accessories, and Cuaron doesn't engage them in very many plot twists until the climax starts to unfold (although to be fair, his sense of resolution is a lot more rich and balanced here than it was with either of the previous films). On the visual scale, the movie has resonating touches, such as a moving tree that swings back and forth in response to nearby human activity (there is even a moment of brilliance in which the tree shakes off the snow from its branches, and the ice hits the camera lens as if there is no visual effect in the scene), and a map of inside Hogwarts that, when activated, allows others to see exactly where certain people are and what directions they are headed in. 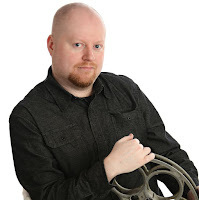 The picture also plays an interesting trick with the concept of time travel, and the manner in which screenwriter Steve Kloves approaches this is both skillful and believable in the way it resolves crucial issues. But take away the various touches of imagination, and "Harry Potter and the Prisoner of Azkaban" is basically a routine vehicle that plods its way through detail after detail without giving much incentive to feel engaged by the specifics. It more or less has the same payoff that its two predecessors did: the kind that makes you wonder if there is still light at the end of the tunnel for a movie franchise that remains as ambitious (but problematic) as this one.